It was another hot, sunny afternoon in the capital and The Malaysian Pancake Co was where we were heading. This is a stall situated in The Old Truman Brewery, home to many a world food stall, and what I feel may become a haven for Dinnergeddon. The stall will stand out as the one with the guy singing a jolly tune about pancakes! The stall sold Malaysian Pancakes with a variety of unusual fillings (such as chocolate and cheese, cheese and raisins). 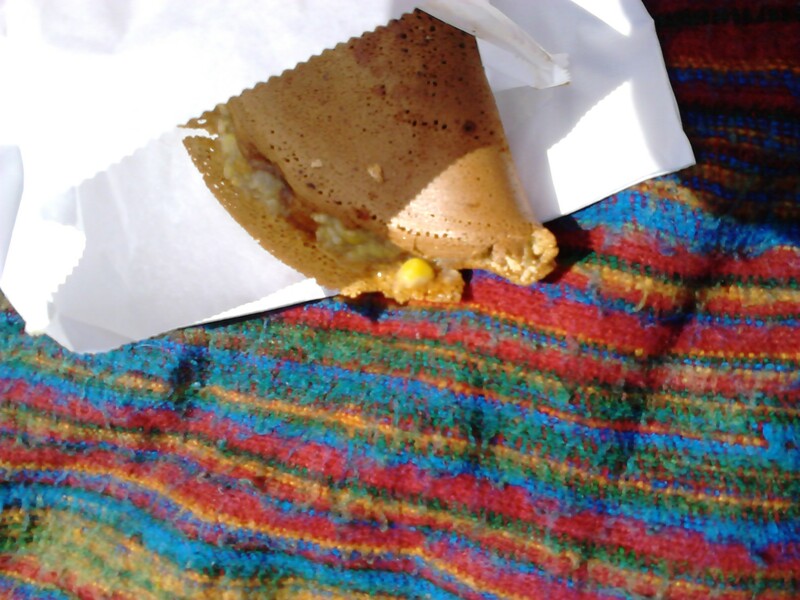 Not feeling particularly experimental, we opted for the more tame Apam Balik, the most traditional pancake on offer, which consisted of peanuts and creamed sweetcorn, and the Malay-American fusion, lemon and ginger. The pancakes were made to order in front of you which was interesting to see. We do feel like staff resources could have been utilised more effectively – there were two staff – one passing the other a paper bag once the pancakes were ready, and the other doing everything else (including singing the jolly tune!) 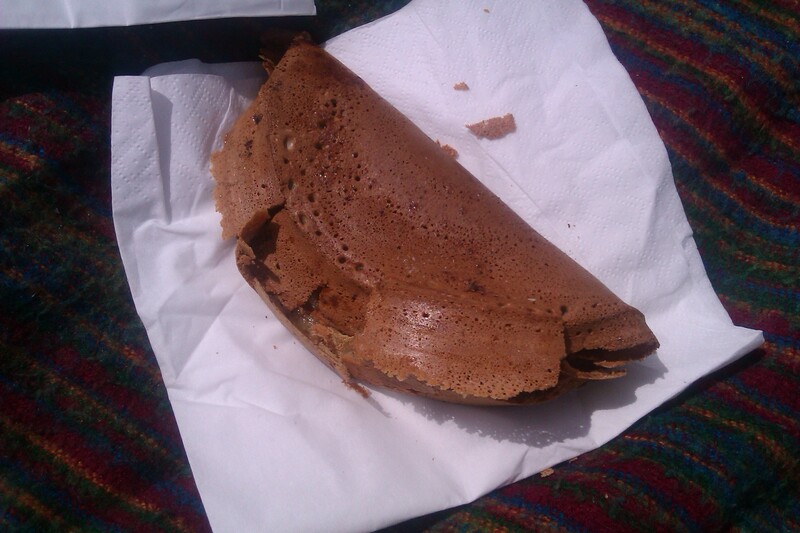 After parting with a reasonable £7 for our two pancakes and gobbling a free sample (black rice and coconut – very nice) we headed to a park off Brick Lane to enjoy them. The Apam Balik was a good combination but I was left struggling to suss out whether it was supposed to be sweet or savoury, and the lemon and ginger was just delightful. (The pictures don’t really do the food justice). We would definitely recommend The Malaysian Pancake Co and, for those of you not wanting to head east, according to their website there are a few stalls around London. This entry was posted in Uncategorized and tagged apam balik, brick lane, Dining, Dinnergeddon, Eating out, Food, London, malaysia, old truman brewery, restaurants, The Malaysian Pancake Co by dinnergeddon. Bookmark the permalink.